YouTube is the best place for videos, and the YouTube app for iOS also provides a great way to enjoy videos on iPhone or iPad while on the go. With the YouTube app, you’ll be able to upload and watch videos, keep up with your favorite channels, browse your subscriptions and playlists, and much more. However, you’re not allowed to download videos from YouTube to iPhone’s camera roll. There is no download feature in the YouTube app, or on YouTube web version with Safari. If you don’t mind paying, you can subscribe to YouTube Read to watch videos without ads and save videos for offline viewing without internet connection. But you still need to watch videos in the YouTube app and cant save YouTube videos to camera roll or transfer videos to any other device. Searching for alternative ways to download YouTube videos to your camera roll? You have come to the right place. In this guide, we will show you 2 easy ways to download YouTube videos directly to iPhone or iPad. Read on and check how it works. There are various applications found in the iOS App Store that help to save YouTube videos on iPhone/iPad. Here we’d like to recommend Video Downloader Browser. Using this browser, you can easily download any video from YouTube to camera roll without the help of the native YouTube app. Step 1: Download the Video Downloader Browser from App Store, install the application and launch it on your iOS device. Step 2: Open the YouTube’s website from the Video Downloader Browser app, and browse for the video you want by typing the keywords of the video name in the search bar. Step 3: Play the video and wait it to be fully loaded, a pop-up window will appear with the option “Save in memory”. Tap on it to download the video from YouTube to the app file folder. Step 4: To save the video to iPhone’s camera roll, just go to the saved video section and click on the “i” icon besides the name of video, then choose the “Save to Camera Roll” option. Another way to download YouTube videos on iPhone or iPad for offline viewing is using Documents 5. It’s a PDF reader, file manager with an integrated web browser, which makes it easy to download YouTube videos to camera roll. Step 1: Download Documents 5 developed by Readdle from App Store, install and run the app on your iOS device. Step 2: Open the YouTube’s website in the Documents app, search the YouTube video you want to download and copy its URL. Step 3: In a different browser tab, open a website that can download YouTube videos, such as Savefrom.net. Then paste the video link to the “Enter the video link” field. Step 4: The site will generate download links for the YouTube video. 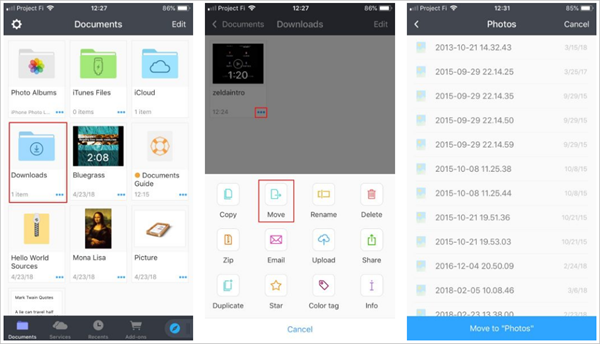 Select your desired resolution and tap on the “Download” button to save the video to the Documents app. Step 5: After that, open the “Downloads” folder and long press the video you just downloaded, then choose “Move” to move the the video to iPhone’s camera roll. 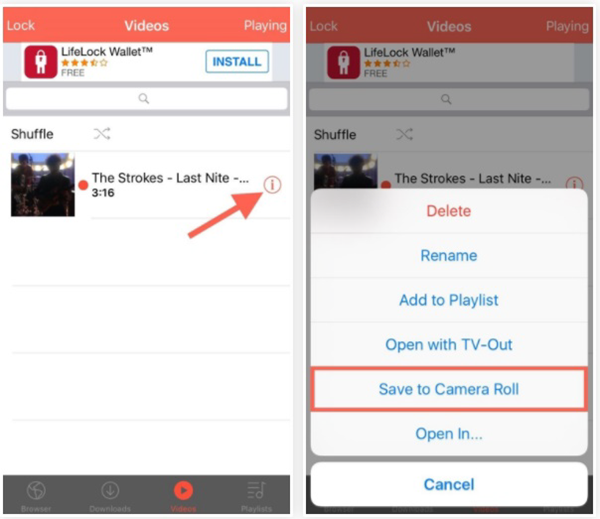 Now you have learned 2 ways to download and save YouTube videos to your iPhone’s camera roll, then you can play the video whenever you want without network connection, or transfer the video to any other device according to your wished. If you don’t want to go through so many steps, another easy way is to download and save YouTube videos onto your computer, and then transfer it to your iPhone. There are many YouTube downloader and converter available, such as Gihosoft Free Video Converter. This free and easy-to-use tool can help you download YouTube videos to PC or Mac and convert them to compatible formats for playback on iPhone or iPad. Worth reading: Download youtube 1080p youtube downloader online.